Every single piece of synthetic plastic that has ever been manufactured since 1950 is still in existence today, as each one takes thousands of years to break down. A recent study has indicated that plastic litter can become fused with rocks and other materials to form a new material: plastiglomerate. This material could very well become a permanent part of the geological record, forever marking humanity’s impact on the world. The results of the report were published in the journal of the Geological Society of America, GSA Today. A while ago I put up a photo of a glass beach, all the glass that were dumped and eventually formed pebbles over the years. 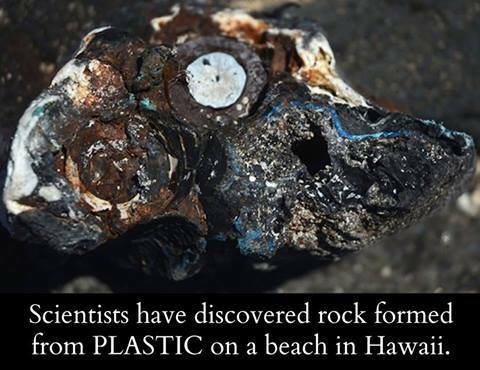 Another interesting phenomenon – and this would be our legacy in the fossil record! Should not every day be earth day? Nobody cares to switch off? Garbage unsorted on the side of the road – they simply could not be bothered. The thought of CO2 – what’s that? Spoilt brats won’t inherit the earth; there will be no earth to inherit. People are not educated because they do not want to be educated. PS I think if I had to become very old I would become like Clint Eastwood in Gran Torino – except I will not become very old I have my little cyanide pills – my kids won’t have to bother!